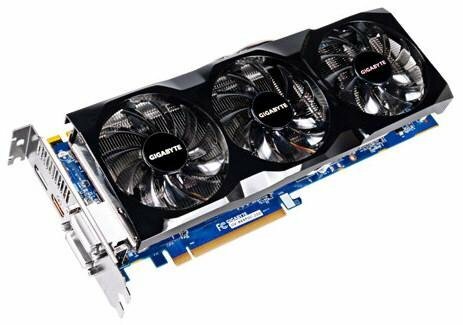 TC Mag reports Gigabyte has upgraded its Radeon HD 6970 WindForce 3X graphics card with a NEC proadlizer capacitor that promises more stable power during high loads. Other than that the card looks the same as its predecessor, it has the same stock clockspeeds and a cooling solution with vapor chamber, three PWM fans, and three copper heatpipes. It's unknown if the pricetag has changed. Like it's 'predecessor', the 2.0 card has Ultra Durable VGA features like the 2oz copper PCB, Japanese solid capacitors, Ferrite Core and Metal Chokes and Low RDS MOSFETs (the Proadlizer is part of the VGA+ package), and includes 1536 Stream Processors, a GPU clock of 880 MHz, a 256-bit memory interface, 2GB of GDDR5 VRAM @ 5500 MHz, CrossFireX support, and dual-DVI, HDMI (gold-plated) and DisplayPort outputs.